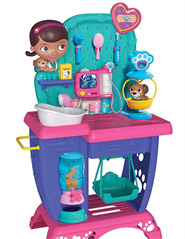 The Doc McStuffins Pet Vet Checkup Center from Just Play stands three-feet tall, and has many fun features including lights and sounds. It also comes with a play Findo the dog, and numerous accessories to take care of him. 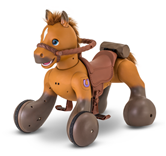 Kids can slide in play x-rays, weigh the animals using the scale, check the animals' hearts with the talking stethoscope, and kid-powered EKG, give them a bath with the pretend water sprayer, groom or feed them, give them a sticker bandage or a treat, and more. There's also a removable otoscope, thermometer, and pet swing. Kids can play vet and take care of their beloved pet friends just like Doc McStuffins with the Pet Vet Checkup Center. Inspired by the top-rated Disney Junior series, this checkup center includes lights and sounds, and offers many different ways to play. Interactive features include play x-rays, a scale, talking stethoscope, kid-powered EKG, pretend water sprayer, pet treat dispenser, and more. Aspiring veterinarians, Doc McStuffins fans, and animal lovers will enjoy exploring all the Checkup Center's features, and caring for the included Findo the puppy, or their own stuffed animals. It offers imaginative roleplay. The Doc McStuffins Pet Vet Checkup Center is for aspiring veterinarians, Doc McStuffins fans, and animal lovers ages 3 and up. Assembly is required, and it took us at TTPM about 25 minutes to put together. It also requires three AA batteries, which are not included, and the ON switch is located on the battery compartment.